Born in Kamishly, Syria on May 3, 1965, the youngest son of Mr. and Mrs. Issa Karim, lost his father at an early age and was raised with the rest of his family by his late and loving mother Khanema. He entered St. Ephrem’s Theological Seminary in Atchaneh, Lebanon in 1977, following his primary schooling in Kamishly. Upon completion of his seminary studies in 1982, His Eminence served the Syrian Orthodox Archdiocese of Aleppo, Syria for the next two years. From 1984 to 1988, Archbishop Cyril pursued higher studies at the Coptic Theological Seminary in Cairo, Egypt, receiving a bachelor of divinity degree upon graduation. In 1985, Metropolitan Karim made his religious profession as a monk of the Church and was ordained to the diaconate in Egypt. Later the same year, he was elevated to the sacred priesthood in Kamishly. From 1988 to 1989, Mor Cyril served as both the secretary of His Holiness Moran Mor Ignatius Zakka I Iwas, Syrian Orthodox Patriarch of Antioch and all the East, and as a teacher at St. Ephrem’s Theological Seminary in Damascus, Syria. In 1989, His Eminence entered St. Patrick’s College in Maynooth, Ireland from where he was to receive a licentiate of sacred theology degree in 1991 and his doctor of divinity degree in 1994, following the defense of his doctoral thesis on the symbolism of the Cross in early Syriac Christianity. On Sunday, January 28, 1996, His Eminence was consecrated as Metropolitan and Patriarchal Vicar of the Archdiocese of the Syrian Orthodox Church for the Eastern United States by His Holiness Patriarch Ignatius Zakka I at St. Mary’s Syrian Orthodox Church in Kamishly. Archbishop Karim arrived in the United States on March 2, 1996, and was officially installed as Archbishop and Patriarchal Vicar of the Archdiocese for the Eastern United States at St. Mark’s Syrian Orthodox Cathedral in Teaneck, New Jersey on March 3, 1996. On December 8, 1996, His Eminence presided over the consecration of the new Archdiocesan Cathedral in Teaneck. 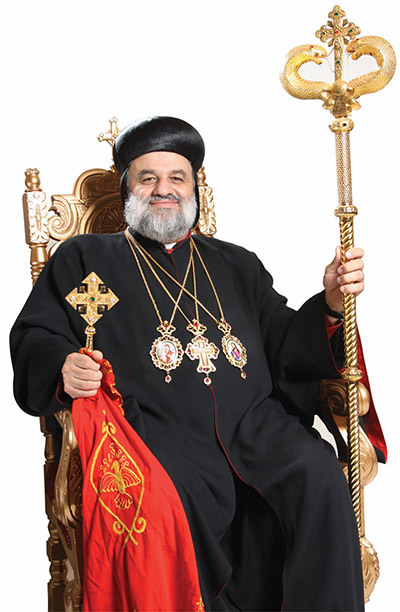 On March 31, 2014, his eminence Archbishop Aphrem Karim was elected as Patriarch. 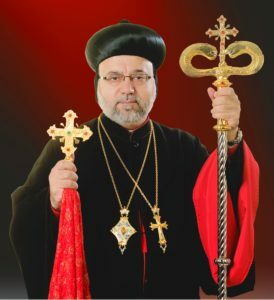 On May 29, 2014 his holiness Moran Mor Ignatius Aphrem II was officialy installed as the The Patriarch and supreme head of the Syriac Orhtodox Church of Antioch and all of the east. 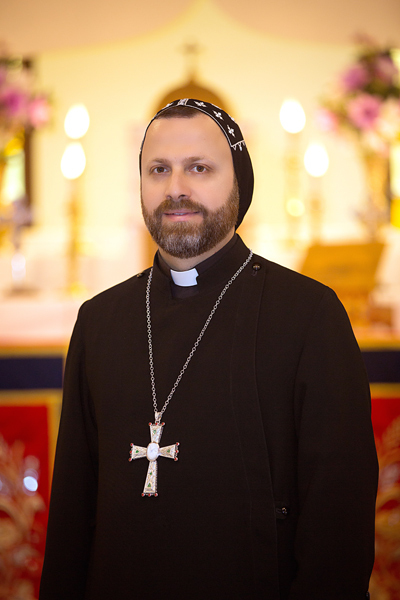 The Very Reverend Father Andrew Bahhi was born on February 1st, 1977 in Hassakh, Syria to George and NajoumaBahhi. He has 3 brothers and two sisters. When he was 20 years old, in June of 1997, V. Rev. Fr. Andrew Bahhi joined the Saint Aphrem Seminary in Ma’arat, Saydnaya located in Damascus, Syria. The love of God and his will to serve God and the Church provided the foundation needed for V. Rev. Fr. Andrew to commit his life completely to God by becoming a monk on February 27th, 2000 and then, on August 5th, 2001, by becoming ordained as a priest. From 2000 until 2002, V. Rev. Fr. Andrew Bahhi served in the Patriarchate in Damascus, Syria. He was sent to America to continue his ministry. After arriving in the United States, he served in the Western Archdiocese in Los Angeles, CA for one year. Beginning in 2003, he served as a priest travelling between 3 churches: Chico, CA (St. Elias Church); San Jose, CA (St. Thomas Church) and San Diego, CA (St. Paul’s Church). He became a fulltime priest for San Diego (St. Paul’s Church) early 2004 until 2007. While in San Diego, he was travelling to Arizona on Sunday afternoon to serve at the Virgin Mary Church. He then served as Patriarchal Vicar in Egypt from the rest of 2007 until 2012 (Virgin Mary Church). While in Egypt, throughout the unrest and war in Syria , V. Rev. Fr. Andrew was always being challenged about faith and politics. On a flight from Egypt to Syria, A Syrian commander who happened to be sitting next to Father Andrew asked him “Which side are you on?” Father Andrew replied “I am always on God’s side.” The commander took out his phone and played a YouTube video and said “why can’t you Christians be like this great priest that spoke out at a rally for peace and unity? You all need to come together and speak out your faith”. As the commander showed Father Andrew the video, Father Andrew turned the cabin light on and said: “Look this priest you’re talking about is me! Do you see me?” This incident was not a circumstance, it was another one of God’s plans in Father Andrew’s life. Upon returning to the United States, V. Rev. Fr. Andrew Bahhi served as a priest in Roanoke, VA(St. Philoxenusof Mabug Church) from 2012 until 2014. Afterwards, in Washington, D.C. (St.Aphraim Church) from 2015 until 2016. In 2017, he began serving Virgin Mary Church in Paramus, NJ until present. Rev Father Andrew is known for his powerful and engaging sermons, leaving parishioners with daily application of how to get closer to God. During the Sunday sermons as well as the weekly Bible study sessions for youth and adults, his messages are easily understood focusing on spiritual growth and filled with the Joy of the Lord. V. Rev. Fr. Andrew Bahhi received his degree from Saint Aphrem Theological Seminary from and is now pursuing his master’s degree in Theology from Seton Hall University, New Jersey with anticipated graduation Spring 2019.